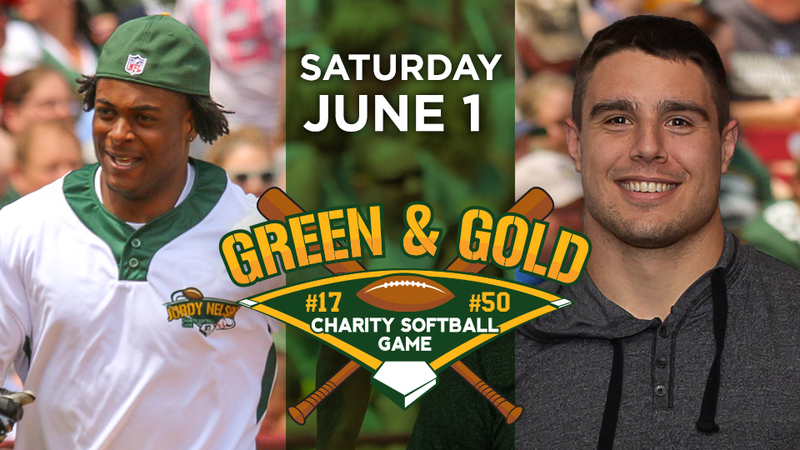 GRAND CHUTE, WI - Davante Adams and Blake Martinez will host the 2019 Green & Gold Charity Softball Game presented by Thornberry Creek LPGA Classic on Saturday, June 1 at Neuroscience Group Field at Fox Cities Stadium. Game time is scheduled for 12:05pm. Individual tickets for the game will go on sale Tuesday, December 18 at 10:00am through the Wisconsin Timber Rattlers ticket office and website. Fans can get tickets a week ahead of that date by purchasing a special four-game ticket package that includes tickets to the softball game and vouchers good for any three Timber Rattlers home games during the 2019 regular season. "I am looking forward to once again hosting the Green & Gold Softball Game," said Adams. "It's always a fun day out there with fans and showing everyone how we can hit it, too." In the 2018 game, Robert Tonyan hit a walkoff home run to give the team captained by Clay Matthews a victory in front of 8,228 fans. "I'm excited to team up with Davante on this great tradition," said Martinez. "I can't wait to get out there and see all the fans on June 1st….and yes, my team is going to win." The four-game ticket package will be available to fans on Monday, December 10 at 10:00am through the Timber Rattlers Ticket Office by calling (800) WI-TIMBER, (920) 733-4152, or in person at the Neuroscience Group Field at Fox Cities Stadium Box Office. These ticket packages will also be available online through TimberRattlers.com. The first two rows of the seating bowl at Neuroscience Group Field at Fox Cities Stadium are the premium box seat option in this ticket package. Vouchers for the Timber Rattlers games must be redeemed at the box office and are based on availability. Individual tickets for the Green & Gold Charity Softball Game, which includes the sponsor game at 10:00am and the Home Run Derby at 11:00am, go on sale Tuesday, December 18 at 10:00am. Tickets for the softball game are $69 for a premium box seat, $48 for a box seat, $29 for a reserved bleacher seat, and $14 for a general admission grass seat. There are also a limited number of patio tables available at $255. Patio tables seat four people and include waitstaff service and an autographed item from the captains. All You Can Eat Seats are available for $87 for the softball game only. These seats are located on the first base side of the stadium and include a ticket to the Green & Gold Charity Softball Game and an all-you-can-eat picnic. Individuals who purchased tickets for the Donald Driver Charity Softball Game may purchase tickets for the Green & Gold Charity Softball Game on December 17 at 10:00am. The Green & Gold Charity Softball game will benefit multiple charities in Northeastern Wisconsin.